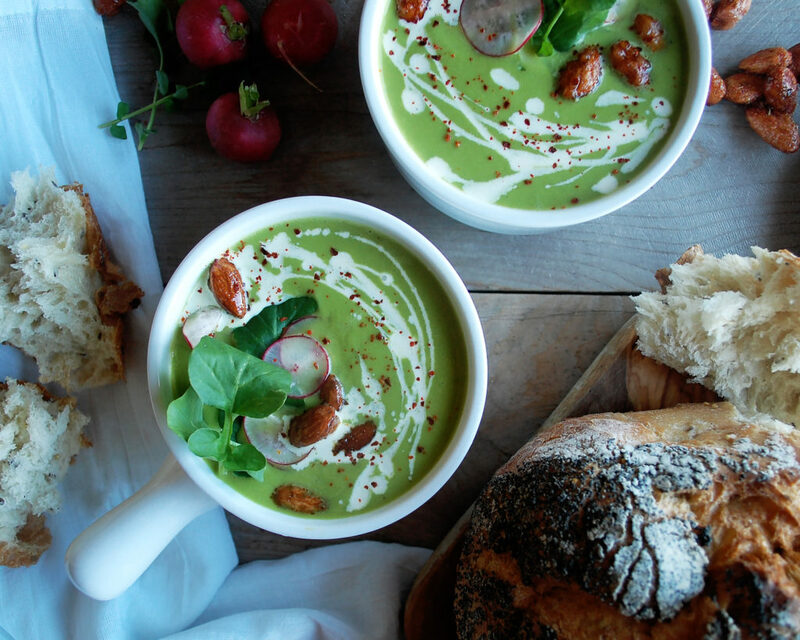 Spring is finally in the air, and I couldn’t think of a better way to celebrate the new seasonal produce than with a creamy asparagus soup. I think asparagus is an extremely underrated vegetable. To be honest, it’s terrible when overcooked, and all you can feel is that stringy texture between your teeth. But, if you do everything in your power not to overcook it, you’ll be left with a beautifully tender, slightly crunchy green vegetable that shines during the springtime. 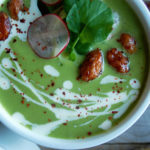 This asparagus soup recipe takes away most of the worry with texture issues since it all gets pureed anyways, but I still want to share a few different techniques you can try to eat asparagus in other ways. – Always peel your asparagus. The exterior can be tough and extra stringy. – Try eating it raw. You can use a peeler to shave thin strands. Toss them with other shaved vegetables, a squeeze of lemon, a drizzle of olive oil, some herbs, and a pinch of sea salt and you’ve got yourself a bright, simple side dish. – Give white asparagus a try. It has a slightly different texture that might be more appealing to some people. – When cooking, a quick blanch is all you need. 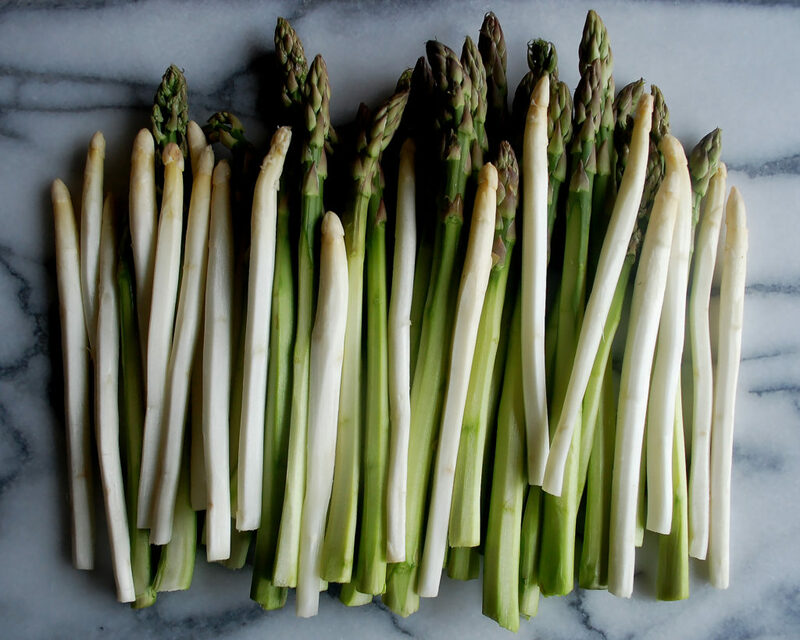 Start by adding the asparagus to a large pot of boiling, salted water. Keep a close eye on it while in the water. If you blanch it too long, you’ll get that undesirable texture I was talking about earlier. After just a minute or two, transfer it to an ice bath (just a bowl of ice and water) to cool, and then remove it to dry. You should end up with a bright green color. – Grilling lends the most flavor, in my opinion. Once you’ve blanched your asparagus, you can either eat it cold with some lemon and parmesan cheese on top, heat it up in a sauté pan with olive oil and spices, or best yet grill it. Getting those nice grill marks is where it’s at. Now that you know all about using asparagus, I thought I’d mention that spring has so much other produce to offer. Most farmer markets are just beginning to load their streets with fresh, local goodies like beautiful peas, crisp radishes, and tasty lettuce. I love this visual guide to spring produce from Saveur magazine. They show the most beautiful morel mushrooms which I’ve got to get my hands on. I also got inspired to make some sort of sweet rhubarb jam…or maybe a tart? The possibilities are endless. As you can see, I am SO excited spring is here. And the fact that Easter is right around the corner is crazy. This weekend I’ll be working on a cake for our Easter brunch, and it will honestly probably take 10 attempts because I haven’t baked a cake in a very long time. Anyways, back to this soup. It’s creamy, bright green because I add a heaping handful of spinach while I’m blending it, and it has the most beautiful garnishes. My favorite of which are the savory candied almonds. They’re glistening little gems of sweet nuttiness that I sprinkle with a simple spice blend to make them extra delicious. 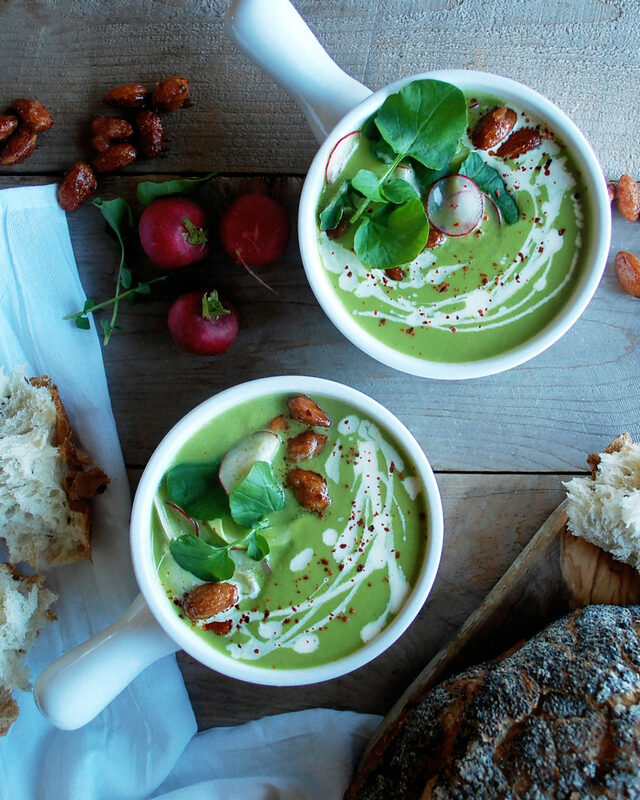 They’re kind of addicting on their own, but also add the perfect crunch to the soup! 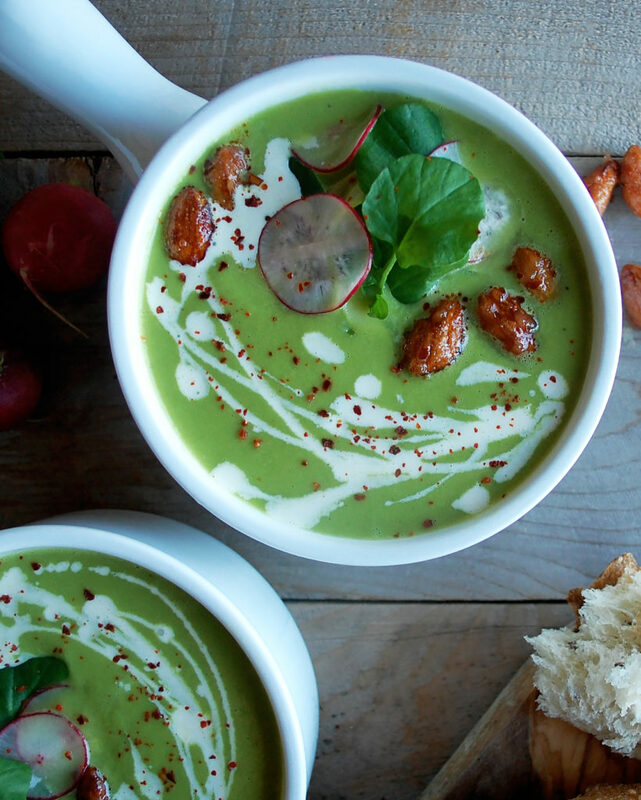 I hope everyone enjoys all the beautiful spring produce out there, and definitely pick up some asparagus to whip up this soup. It’s a healthy springtime dish that you won’t want to miss! Enjoy! Combine the smoked paprika, coriander, onion powder, and anise seeds in a small bowl. Mix until incorporated and set aside. Combine the almonds, sugar, and water in a small saucepan. Bring to a boil over high heat and let the sugar dissolve. Reduce the heat and simmer until the syrup reduces and coats the almonds like a glaze. Watch the syrup closely. If it doesn’t reduce enough, it won’t create a strong sugar coating around the almonds. If it reduces too much, it will crystalize and become grainy once fried. Meanwhile, heat 3 inches of oil in another small saucepan over medium heat. Once the almonds are ready and the oil reaches 300F, use a slotted spoon to transfer the almonds to the hot oil. 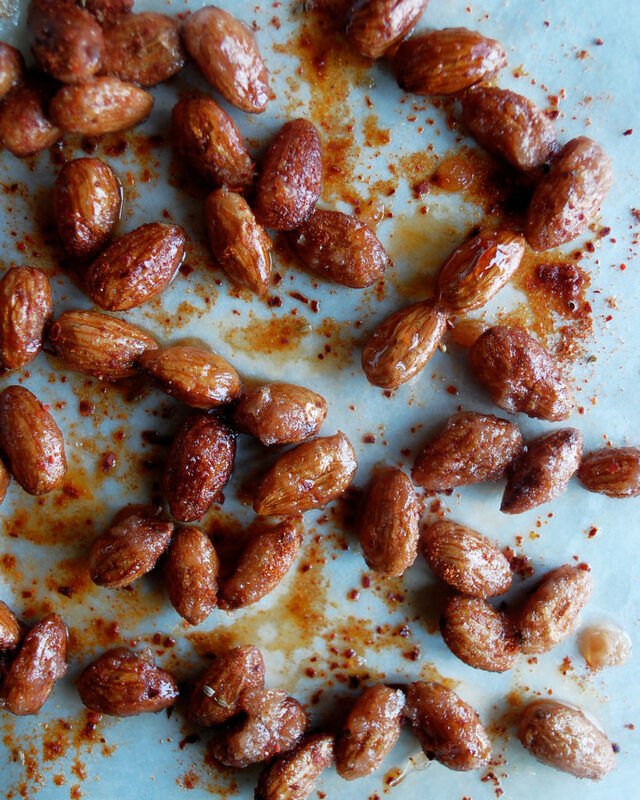 Fry the almonds until golden brown, just a minute or two. Adjust the heat if needed to maintain 300F. Use a slotted spoon again to transfer the almonds to an oiled piece of parchment paper (don’t use regular paper towels, they will stick). Sprinkle the almonds with salt and a generous pinch of the spice mixture while they’re still warm. Let the spices settle onto the almonds as they cool. Take the asparagus, bunch it up, and cut the stalks into 3 pieces each (basically large chunks are what you’re looking for). Coat the bottom of a medium pot with a generous amount of oil over medium heat. Add the shallot and sauté until translucent, about 2-3 minutes. Stir in the asparagus. Season with salt and pepper. Add the stock and bring to a boil. Reduce the heat to low, cover the pot, and simmer until the asparagus is fork tender, only about 10 minutes. Working in batches, blend the hot soup with the spinach. Try to get an even ratio of asparagus to stock to spinach in each batch. Transfer the soup to another pot or a large bowl. Stir in the heavy cream and lemon juice. Season with salt to taste. While the soup simmers, take the 3 asparagus and continue to peel them so you end up with thin strands. Toss the shaved asparagus and radishes with a squeeze of lemon and a seasoning of salt and pepper. 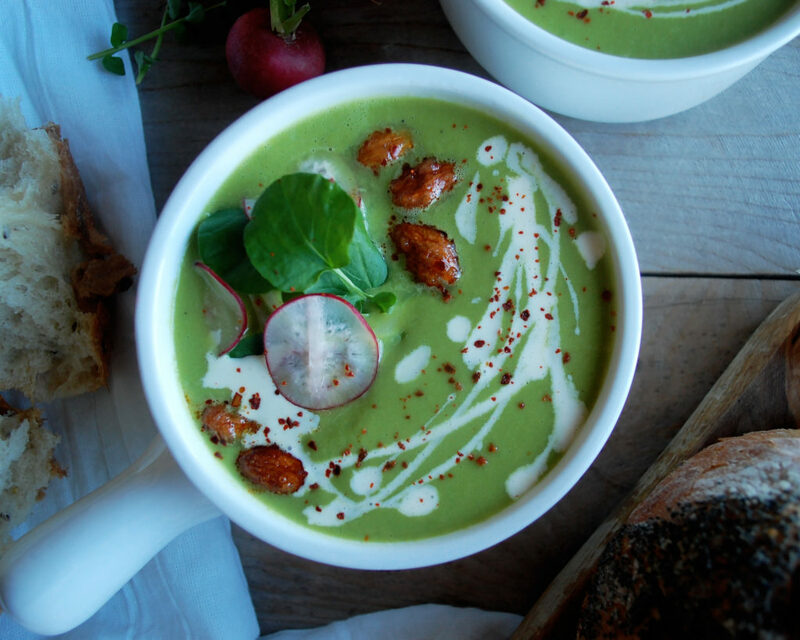 Serve a few ladles of warm soup in a large bowl. 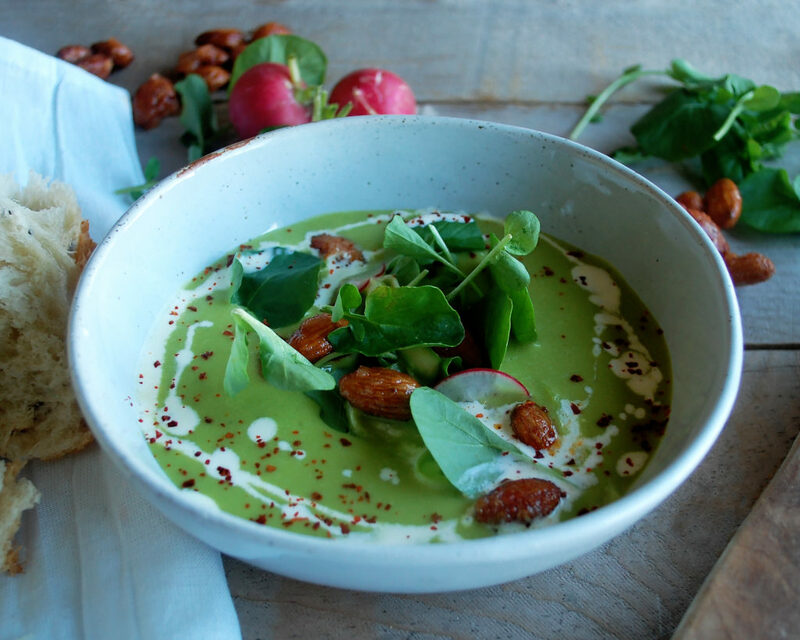 Top the soup with a small mound of shaved asparagus and radishes. 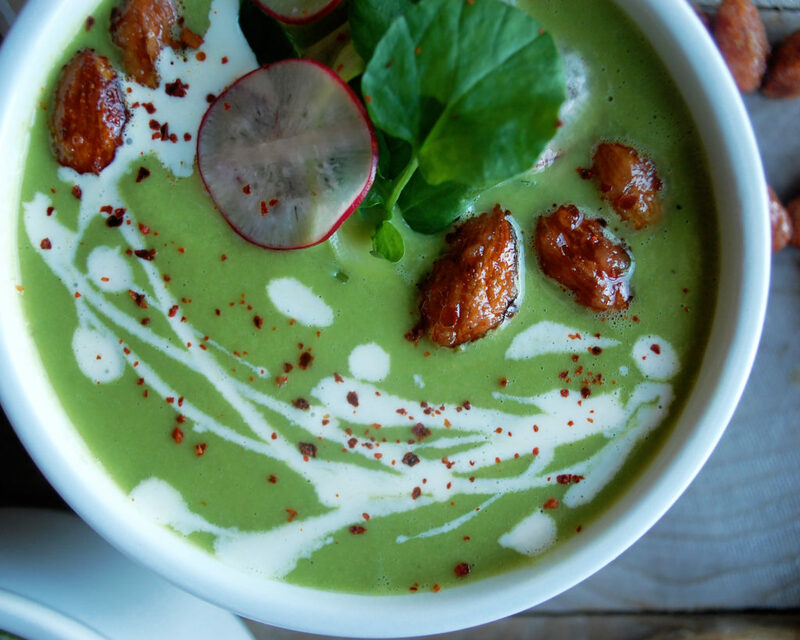 Finish the soup with a few sprigs of watercress, a drizzle of heavy cream, and a spoonful of the savory candied almonds. I remember the first time I read from Harold McGee that out of all vegetables, no other metabolized their own sugars as fast as asparagus. As soon as you cut, you’re on a timer. Made me sad I couldn’t grow my own at the time. I would love to expand my garden and grow all sorts of vegetables! And yes, i think Harold McGee is amazing…so much good information.